The bass drum is one of the most important aspects of drumming. Not only does it drive the beat, but it also adds so much to any style of music. There is so much you can do with your bass drum technique to change the dynamics of a song, the style of a song, and even the speed of a song. Learning proper bass drum technique at an early stage is key; however, it is never too late to learn. It is recommended that you develop double bass drum technique, single bass drum technique, heel up technique, and heel down technique. These are just a few bass drum essentials every drummer should know. The first two techniques every drummer should learn are the heel up technique and the heel down technique. Both of these styles of bass drumming have their place, so both should be mastered. The descriptions of these techniques kind of explain themselves. For example, heel down bass drumming is where you play the bass pedal with your heel on the pedal. This is great for softer playing; since you have complete control over your pedal you can generate softer accents and quieter hits. This is great for jazz and ballads! Heel up, like the title says, is when you play the bass drum with your heel off the pedal. This is great for getting a lot of speed and power from your foot. You can put the whole weight of your leg into the kick this way. Great for rock and heavier styles of music. When you are playing the double bass drum, there are a few techniques that you should learn with this as well. First off, the same rules apply for double bass pedals as they did with single bass pedals. Heel up and heel down must be established and mastered on both feet. Next, you want to develop both your left and right foot the same time. This is not as easy as it sounds. Make sure you double bass drum pedal is set up correctly. This way you will have an even feel on both pedals. Next, practice your rudiments! Make sure you technique is exactly the same on both feet. If this is not the case, you will get issues with different volumes and uneven sounds. The other two bass drum techniques you should learn are the slide technique, and the heel-toe technique. Both of these bass drum techniques are ways to double your bass drum speed. These skills are a little bit tricky to explain in text; however you should definitely take the time to research these amazing techniques. You can play these with singles bass, or double bass, and add a lot of variety to your grooves. There you have it, a few bass drum techniques that should give you much more control with your bass drum. Research these concepts and learn them, as they will only boost your skill as a drummer! 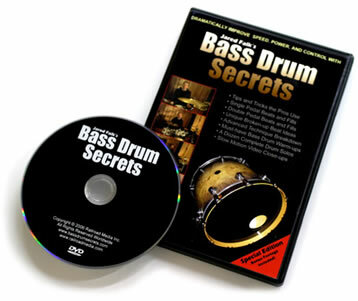 For more information about bass drum technique, check out Jared Falk's Bass Drum Secrets training video. It covers advanced methods, and it teaches you how to apply the techniques in beats, fills, and drum solos. This instructional DVD is very detailed, and is priced fairly. You could probably pay upwards of a few hundred dollars for private lessons with a teacher that may not even be able to properly teach these methods.